The country of Nigeria resides in West Africa, where it lies directly to the west of Cameroon, to the south-west of Chad, and to the south of Niger. 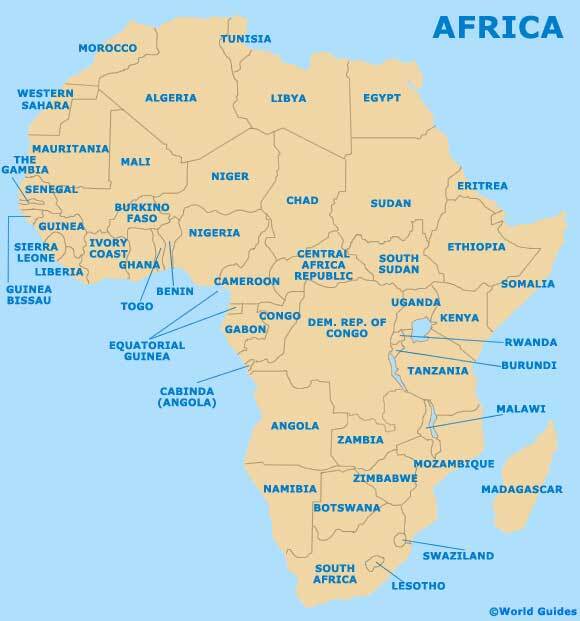 Nigeria is also to the east of Benin, while its southern boundary is edged by the Gulf of Guinea - part of the Atlantic Ocean. 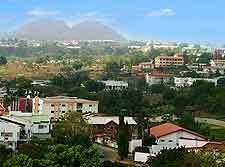 There are no less than 37 different states, with Abuja, the centrally located capital city, serving as the Federal Capital Territory. Apart from Abuja, the complete list of Nigerian states is - Anambra, Enugu, Akwa Ibom, Adamawa, Abia, Bauchi, Bayelsa, Benue, Borno, Cross River, Delta, Ebonyi, Edo, Ekiti, Gombe, Imo, Jigawa, Kaduna, Kano, Katsina, Kebbi, Kogi, Kwara, Lagos, Nasarawa, Niger, Ogun, Ondo, Osun, Oyo, Plateau, Rivers, Sokoto, Taraba, Yobe and Zamfara. 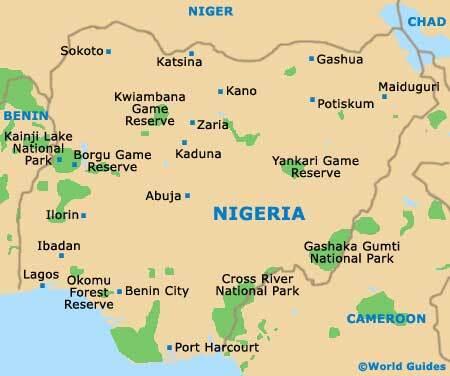 Roughly double the size of California, Nigeria is the 32nd-biggest country on the planet and boasts a lengthy coastline stretching for more than 850 km / 528 miles. 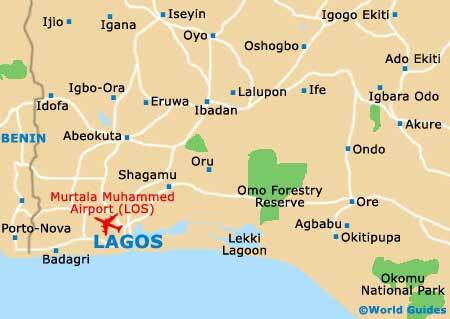 Significant coastal towns and cities shown on most maps include Benin City, Lagos, Port Harcourt and Warri. 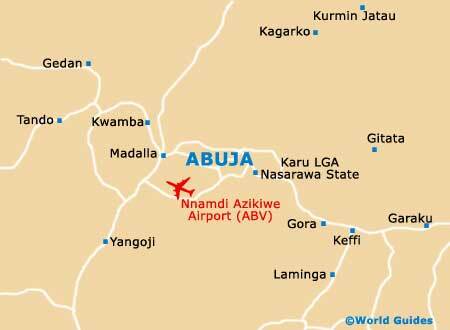 Elsewhere, other noteworthy destinations are Arochukwu, Badagry, Calabar, Enugu, Gusau, Ibadan, Jos, Kaduna, Kano, Maiduguri, Makurdi, Ogbomoso, Sokoto, Yola and Zaria, amongst others. Lagos is the biggest city in Nigeria, with its metropolitan population of some 15 million residents rather dwarfing the 1.3 million living in Abuja. Benin City, Kaduna, Ibadan and Port Harcourt are also sizeable Nigerian cities, each with populations comfortably exceeding one million, while Kano is currently called home by almost three million residents.